Last month Beam announced a “new collection” of limited edition Booker’s releases, the first of which would be called “Big Man, Small Batch,” which pays homage to the late Booker Noe, one of the biggest personalities in the bourbon business. For those looking for this or future limited edition releases, the packaging features a different, larger batch label with an illustration, and the box is stained a darker brown, whereas regular releases (including Roundtable releases) will continue in the lighter, natural wood boxes. 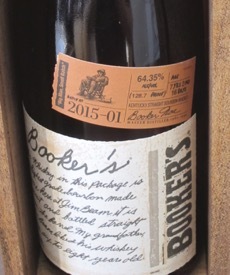 Unlike last year’s 25th Anniversary, the age statement of this first limited edition is within the normal 6-8 years for Booker’s. Specifically, “Big Man, Small Batch” (Batch No. 2015-01) is 7 years, 2 months, and 16 days old. It’s bottled at 128.7-proof (64.35% ABV). At least in Virginia state liquor stores, it sells for the same price as regular release Booker’s: $59. As you’d expect, it’s a full-bodied bourbon in the Booker’s tradition with a bold nose of caramel and vanilla. On the palate there’s more vanilla, peanut butter, and salted caramel. Only on the finish does the high-proof heat come through, along with vanilla and oak. The six-year-old has a bit more sharpness and resinous wood. The Roundtable Batch is more refined and closer to the Big Man, Small Batch in profile, which makes sense given the very similar age statement and proof, but it doesn’t have the toffee-like richness of this first limited release. So as long as Booker’s sells this and future limited edition Booker’s at the same price as the regular batches, it’s easy to recommend to those who enjoy full-bodied, high-proof bourbons. I, for one, am looking forward to future Booker’s releases from this line, and filings last year for label approvals suggest there may be many coming. As for cigars, all Booker’s releases call for the same thing: a full-bodied smoke. The RoMaCraft Cromagnon, Arturo Fuente Opus X, EO 601 Serie “Blue”, and La Flor Dominicana Double Ligero all fit the bill. It’s just “limited” label, the bourbon itself is that the “same” as any other regular Bookers out there (as same as any two small batches can be, anyway). Same deal with Roundtable last year. Nearly EVERY Bookers released was “Roundtable”, that’s just who happened to select last year’s releases. Nothing special about it other than that.